COMMERCE, Ga. (WLS) -- A Georgia police officer took to social media to applaud one of her colleagues who went above and beyond the call of duty. 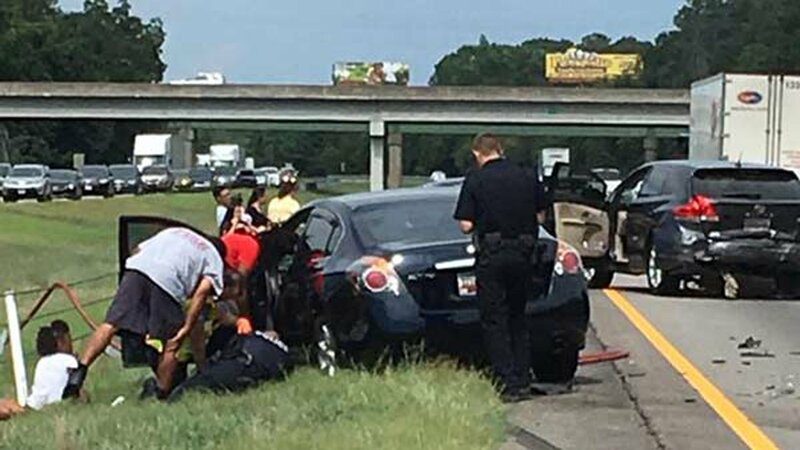 Officer Kay Denton posted a photo on Facebook showing her fellow officers responding to a car accident on the highway on July 30. An officer can be seen lying on the ground alongside one of the vehicles involved, next to an 8-year-old child who was injured and "scared to death", Denton said. "This officer laid on the ground with this child, cradling his head in his hand and talking to him to keep him calm," Denton wrote. "When we found out that today is the child's birthday, this officer sang happy birthday to him!" Denton wrote that she felt compelled to share a positive story about law enforcement in light of recent "bad cop" stories. "THIS is why I'm a police officer, to help people, to be there for them no matter what the circumstances and no matter what skin color," she wrote.